The web provides a easily accessible platform for multimedia stories using visuals, audio, and even textual messages. Although I am a photographer first, I am quickly becoming multi-disciplinary in video and audio, and am very interested in helping you get your story told in with the best media rich techniques and tools. The following images and videos are examples of images that tell stories. The captions are an important part of the story, but the image needs to communicate clearly as well. 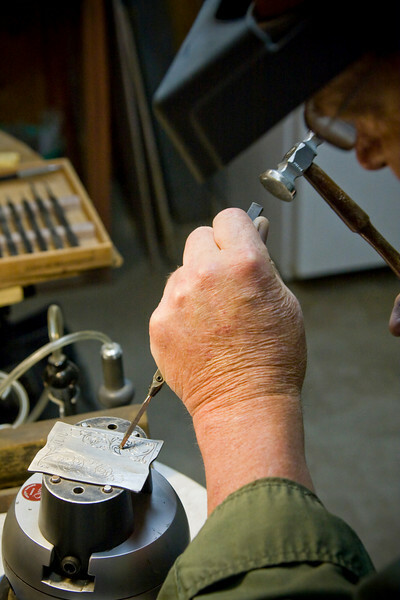 Timothy Alverson knifemaker of Clearwater Knives, demonstrates the fine art of metal engraving on a belt buckle.